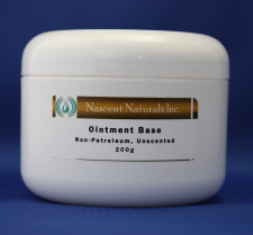 Ointment Base – Nascent Naturals Inc. This product is manufactured in small batches by Nascent Naturals Inc. from a proven recipe which was developed over 15 years ago. All ingredients are natural,non-petroleum, plant based or sourced. Suggested Uses: This product can be used by itself as a natural unscented ointment or add small amounts of essential oils ( up to 3%), carrier oils (up to 5%), vegetable butters etc. to customize for your skincare needs. Great as a natural body butter! **Only fat and oil soluble ingredients can be mixed with this base. Base product should be gently heated in a double boiler till liquid, before mixing supplementary ingredients.